CARD.com, a Bancorp Bank company offers prepaid Visa cards with personality and I must say I really enjoy using it. To me the best part was how easy the getting started process was and looking through all the cool designs they have to offer (which made it very hard to decide). I didn't have any trouble getting the card, the only issue I had was trying to access my account online after I set it up. I thought I created a password for my account during the setup process but apparently I didn't because my password was still set to the pre-selected one, so I had to request a reset (which was very quick and easy) to access my card history and account information online. In general I think it's a good product and a very nice alternative to a traditional checking account. If you know you'll be direct depositing at least $800 a month I would defiantly recommend this company. To get started you just go to www.Card.com, browse through all of the card designs they have to offer and select the one you like most. I went with the "Made in the 80's"design because.... well, I was and I liked the retro look. 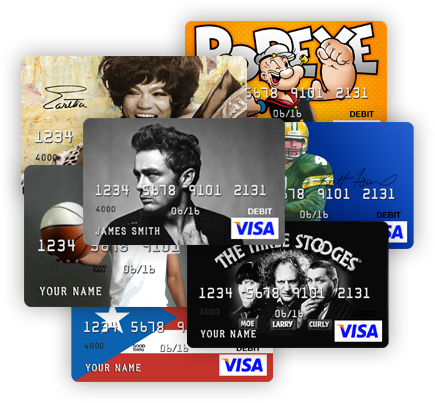 Once you have chosen your card the next step is applying for your card and setting up your account and that should only take a minute or so. They do require a valid SS# to get a card so be ready to enter it.. After that, your card will be processed and shipped to you if there are no issues with creating your account. The shipping for the card was simple and really quick! It took less than a week (which is really good compared to most card companies) for me to receive my card and there was no issues with getting it delivered. The card comes in a very discreet envelope with all the information you need to know about using your card including a semi-pre-filled direct deposit form. There is a easy to use 800 # listed on the card for you to activate your card. You may also go online to active your card but I chose the phone method. Just like with a regular bank, the card comes with a checking account # and a routing # (cool right?). There is a $6 monthly maintenance fee for having this card which is waved each month if you have a direct deposit of at least $800. Also you can load funds to your card using the Card.com website, Western Union or Green Dot MoneyPak.